This summer, we see the return of the culturally rich Simmer Down Festival. 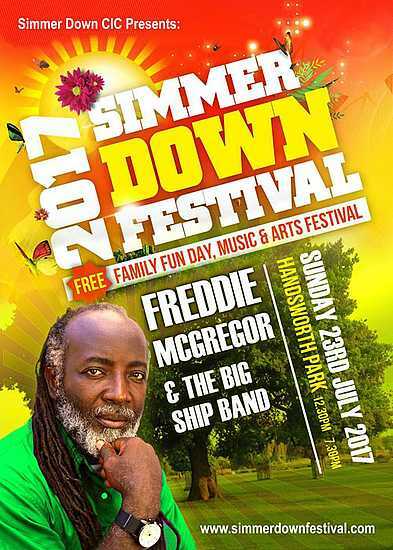 Each year it takes place at Handsworth Park and is thought to be the most diverse free festival in Birmingham. The openness and vast space of the park make for a great location for the lively and exciting atmosphere to quickly spread. Live music, performances, art activities/workshops and food vendors make up the rich variety for visitors to explore. Stage 2 at the event will again be hosted by us, after the success of last year. We have given the stage a name to reflect what makes it special – the Best of Brum Stage. Our aim as Aspire4U is to present this stage for young artists to show their originality, for them to be discovered. We aim to help these young people emerge and gain momentum in their careers, by playing to an audience hoping to see fresh performances. This is exactly what we achieved last year, with thousands of people visiting the stage to see what was on offer. Our stage featured band leader Ashley Allen-an artist who has previously played to a global audience and extended to millions of viewers at the Australian Commonwealth Games. We also hosted Relley C, a previous X Factor contestant. Her talent sustained throughout and she managed to make it to the stage of live performances on the show, reaching the final 12 categories. Such community projects as these help us to show young people how to harness and utilise their skills. But not only are we helping young artists, we also encourage entrepreneurship. As part of this, we’ve taken on volunteers for event management of Simmer Down. This will help enhance a range of people’s opportunitites for career development. Young people can really develop careers from this type of business. Confidence, communication, negotiation and proactiveness are just some of the many benefits to be gained and turned to future employment. Our volunteers have been in charge of producing video content, taking on social media management, meeting and interviewing individuals, and using design platforms/tools in the creation of artwork for the festival. These are just somee of the many responsibilities involved. Not to mention, these skills will look awesome on a CV. Mindset is also something we strive to flourish. Some young people may lack confidence, may feel uncertain about their futures, or just be confused in choosing a career after leaving education. As some may already know, we’re a not-for-profit organisation. We’re there to listen, help, and show ways to help young people to success, financial literacy and stronger mindsets. The value we bring to communities is helping people realise they have options, and that getting support doesn’t always have to cost money. So, if you fancy getting involved and volunteering with us, email admin2@aspire4u.co.uk – please do get in touch! Our Vision: Imagine a world where people understand their brains enough to make better decisions. Then imagine fully understanding money and never being at its mercy; now thread both with individual and collective purpose, so that poverty and disadvantage can be overcome for generations moving forward. Our Mission: Aspire4U works to help communities towards well being. We aim to do this by what you see (online experiences with us) or feel (our events, workshops or programmes). Our Intuition: We believe in sharing things that are evidenced and proven to work with the community. If you care enough to share and would like to blog for Aspire4U, please email Admin@aspire4u.co.uk, using “I want to Blog 4U” as the subject header. We appreciate you all. Next PostSOWETO KINCH’S FLYOVER SHOW IS BACK AND BETTER THAN EVER!